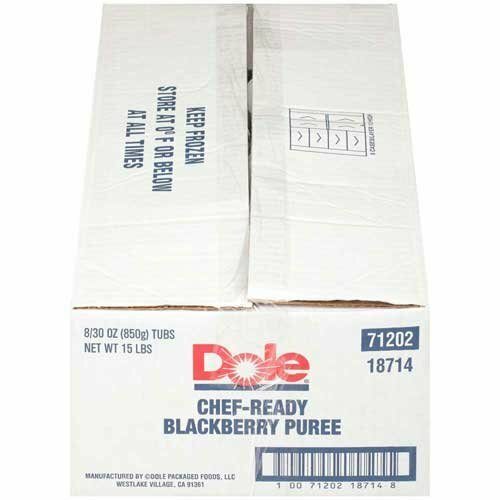 Dole Blackberry Puree, 30 Ounce - 8 per case. View More In Fresh Fruits. If you have any questions about this product by Dole, contact us by completing and submitting the form below. If you are looking for a specif part number, please include it with your message. Dole Individual Quick Frozen Chunk Mango, 5 Pound - 2 per case. Dole Mandarin Oranges in Light Syrup, 11 Ounce - 12 per case. Dole Individual Quick Frozen Chunk Pineapple, 5 Pound - 2 per case. Fruit In Hand Marion Blackberry Pourable Fruit Puree, 35 Ounce - 6 per case. Dole Mango Puree, 30 Ounce - 8 per case. Melissa's Fresh Persimmons, 2 lbs. Del Monte Plastic Mango Cup, 4 Ounce - 6 per case.